Isuzu has unveiled a monster truck that towers over the latest ‘super utes’ from Ford and HSV. Picture: Supplied. ISUZU has unveiled a monster truck that towers over other super utes such as the Ford Ranger Raptor and HSV Colorado SportsCat, but there is just one catch: it's not coming to showrooms anytime soon. The D-Max Concept X is a flight of fancy to show what the brand's ute is capable of once it is modified wildly and fitted with massive 38-inch mud terrain tyres and the suspension is given a seven-inch lift. Unfortunately such a beast wouldn't be legal on Australian roads because it's too wide to fit into a lane. 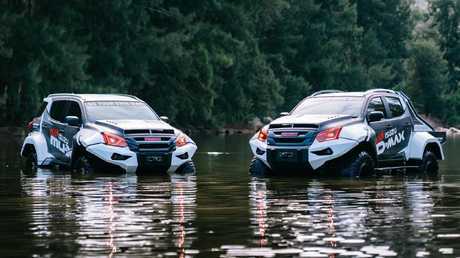 Swamp monsters … Isuzu MU-X (left) and D-Max Concept X Ute (right). Picture: Supplied. 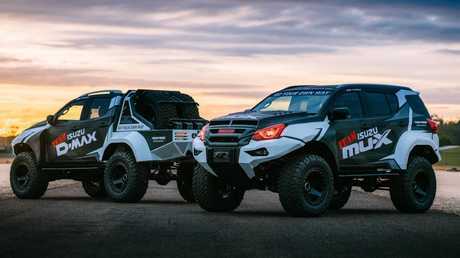 The monster ute - paired with a high riding version of the Isuzu M-UX family seven-seater four-wheel-drive - was unveiled at the National 4x4 Outdoors Show in Melbourne today. "We saw a set of gigantic tyres on the Toyo stand one day and our boss joked about putting them on his company car," said lead driver Jack Monkhouse. Wayne Boatwright, Team D-MAX director said the project then "got a bit out of control". "We didn't set out to build a racer or pre-runner or rock crawler," said Boatwright. 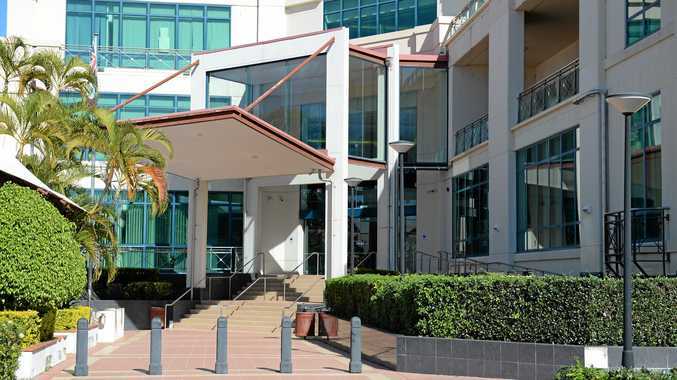 "It would have been easy to bolt on many accessories but we wanted to go our own way. Most of the build (including) the guards, bull bars, bonnet, brakes, suspension and chassis modifications are all in-house custom work." Although the Isuzu 3.0-litre turbo diesel engine didn't get a power bump, the result is a ute that could "almost look at home in the next 'Transformer' movie … the kind of car that every child dreams about". The Isuzu D-Max Concept X Ute looks wild but some of the ideas may be a pointer to future off-road accessories. Picture: Supplied. 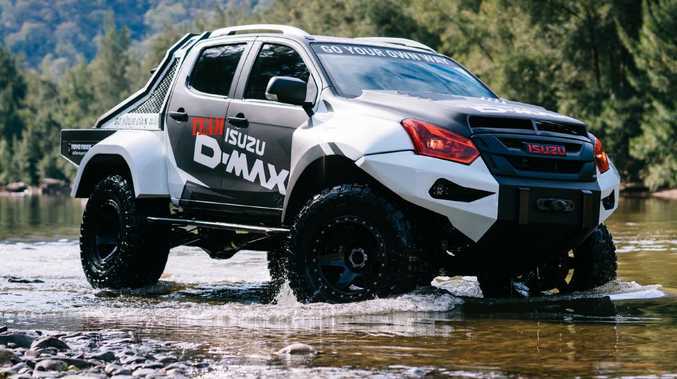 Supplied Cars Isuzu D-Max Concept Ute (August 2018). Picture: Supplied.